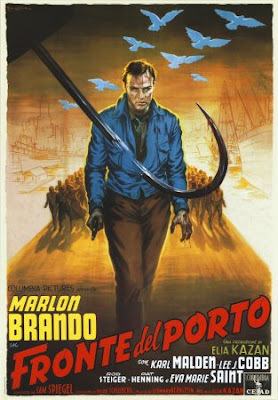 Infinite Art Tournament: The Great Movies: "On the Waterfront"
The Great Movies: "On the Waterfront"
One of my personal rules in the Great Movies project has been to view each movie on its own merits, ignoring so much as possible things that are external to the film. It’s not Martin Scorsese’s fault that a nutjob wove Taxi Driver into the world of his delusion, for instance, so I think it’s best to set that whole story aside when looking at what’s actually happening on the screen. This is a challenge when it comes to On the Waterfront, a film that Elia Kazan made out of reasons so contemptibly self-serving and hypocritical so as to make watching it, for all of its technical mastery, fairly unpleasant to anyone familiar with the backstory. But, I did my best. It really is a beautifully made film. The acting is suburb, starting with the young Marlen Brando but running deep into the cast. Even the extras, working-class Joes recruited to essentially play themselves, do a fine job of acting naturally, which speaks to what must have been great coaching by some assistant director. Scenes are framed and composed marvelously, and the photography is so very good as to almost overreach its mission, as we are occasionally jarred out of the movie when distracted by an especially amazing shot. The movie achieves a rare psychological depth for about four-fifths of its running time. The characters are remarkably plausible, all in their own ways deeply flawed and profoundly selfish, all more or less destructive to themselves and the people they care about, and all deeply convinced of the rightness of their own actions. Which is to say, they're very true to life! There are also some real liberties taken with realism, however. My favorite is a scene deep in the hold of a cargo vessel – did I mention that this is a movie about longshoremen? – where the female lead, a neighborhood girl home from college, suddenly appears among the workers as if this was the most normal thing in the world. How the hell did she get on board? The final scenes deteriorate into a real mess, as things begin happening for no other reason than to propel the movie to a tidy ending. In the final scenes, people act not only implausibly but downright unnaturally. The movie is wedged into something that looks like a conclusion, but even after hashing it over at some length with Mrs.5000 I’m not really sure what we were supposed to think happened there. Plot: After unwittingly setting an acquaintance up for a mob execution, a young tough falls for the victim’s sister. Meanwhile, a hapless priest tries to get the dockworkers to break their code of silence and speak out against the crime racket that controls the waterfront. These two forces set in motion a chain of events that can only conclude in an incoherent final reel! Dialog: A lot of the dialog is pretty expository. Although the film is chock-full of memorable lines that have been quoted into the ground, I’m not sure that the script would have been anything special in a less careful production. Most people, when they say that they could have been contenders, sound kind of dumb. When Marlin Brando says it, it sounds like the accumulated lament of a lifetime full of betrayals. Prognosis: I’m going to recuse myself from any summary judgment of this movie. @MJ: It's just a typo, like "Marlen Brando" or "Marlin Brando." The word is "superb." @Doc: You know, I find Leonard Bernstein consistently just a little underwhelming as a composer. He's not bad, but give me Elmer Bernstein any day. Mostly, I agree with you, but I do love the soundtrack to this one. Okay, I'll bite. What's the distasteful back story? The Great Movies: "Woman in the Dunes"
The Great Movies: "Sweet Smell of Success"